The kitchen is the heart of our family. My dad would spend the weekends making vats of marinara sauce and in the late summer my mom would be canning blueberry jam. Back when apples were cheap we’d make gallons of applesauce with the food mill and mix in low-bush cranberries for color. Most of my childhood memories are centered around cooking. One staple in our family is sausage. I remember waking up early on Saturday morning to the loud humming of my dad’s homemade motorized sausage grinder. I was thrilled to stuff hog intestines with meat — I was the best sausage stuffer in the family thanks to my deft, friendship bracelet-making hands. 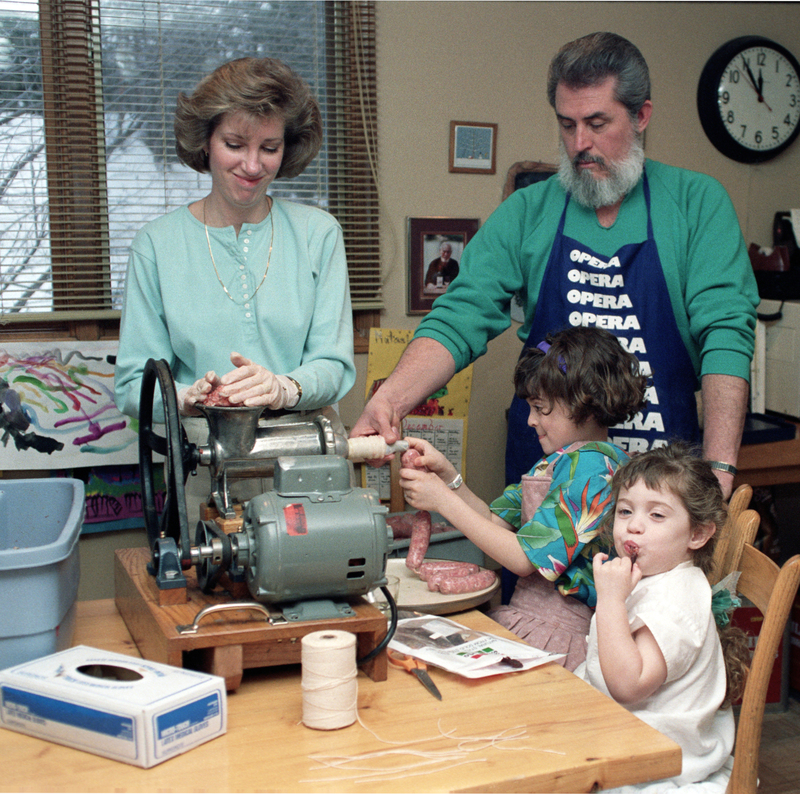 Me, age 9, stuffing sausage with some old family friends. My dad owns one of the most popular sausage-making sites on the Internet, sausagemania.com (yes, that is really the name). People from all over the world come to his site for his detailed recipes and tutorials. When we decided to make 100 pounds of Italian and breakfast sausage this morning at 7:30 I thought it would be the perfect time to make my own tutorial for my little DIY audience.